This tutorial is about creating dynamic views in android based on json data. These json data can be a server response or may be not. For everybodies sake, I have stored my json data in the asset folder itself. But, we can use this tutorial by fetching json data from whereever you want. This may help you to fetch your json data. Ok, now lets get started. Its the process of using one activity as a container and drawing multiple view in the same activity. These views are not declare in XML. We are generating our widgets dynamically. We will create a Profile Activity. The MainActivity is the ViewProfileActivity. EditProfileActivity creates the Dynamic Views and stores user inputs. We have three snapshots of our project. ViewProfileActivity-SS(1) is the screenshot of the Profile Page of the user. The Edit Profile button located in the top of the ViewProfileActivity starts the EditProfileActivity represented by EditProfileActivity-SS(2). EditProfileActivity displays the dynamic views. It allows user to provide their inputs. At the end of the layout, there is a save button through which the user can store their inputs and finish the EditProfileActivity. After the user presses the Save button, they are redirected to the ViewProfileActivity which displays all their inputs stored in the dynamic widgets. ViewProfileActivity just displays the data. 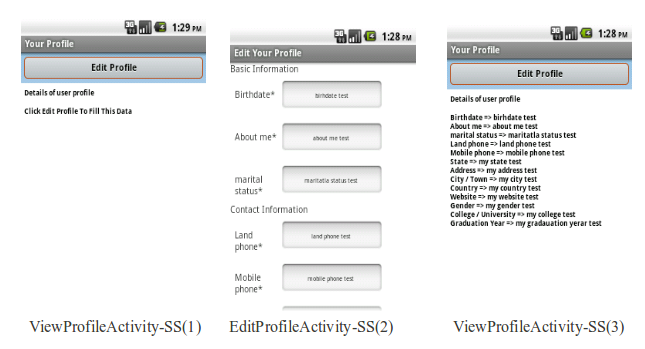 android:text="Click Edit Profile To Fill This Data"
The project is stored in GitHub. Download it and check it out.